Update: Those in the UK can't benefit from the free Gear VR deal - it's now confirmed just to be for those who live in the US. 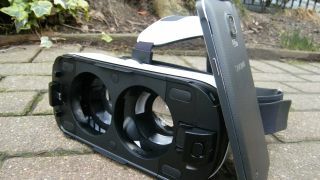 If you've bought a brand new Samsung phone in the last week, you may be able to claim a free Gear VR headset to plug your new gadget into. Samsung is giving away the virtual reality tool to anyone who bought a Galaxy S7, Galaxy S7 Edge, Galaxy S6, Galaxy S6 Edge, Galaxy S6 Edge+ or Galaxy Note 5 from a participating retailer since June 1. Sadly the deal is only for the US right now – Samsung has now confirmed to TechRadar there are no plans to bring this offer to the UK. You need to have bought – or you could buy one in the coming weeks – your phone from AT&T, Best Buy, Costco, Metro PCS, Sam's Club, Sprint, Target, T-Mobile, US Cellar, Verizon or Walmart. Once you've bought the phone you'll then be able to go to this link and submit a form to claim your free Gear VR. If you're set to upgrade to a new Samsung phone you'll still be able to claim the deal until June 19, so there's still plenty of time. Have you read our review of the Galaxy Note 5?